We’d love your help. Let us know what’s wrong with this preview of The Defection of A.J. Lewinter by Robert Littell. A masterpiece of irony and intrigue, deftly and dazzlingly plotted, The Defection of A.J. Lewinter is the novel that established Robert Littell as a master of the Cold War thriller and immediately elevated him to the ranks of John le Carré, Len Deighton, and Graham Greene. A.J. Lewinter is an American scientist, for years an insignificant cog in America's complex defense A masterpiece of irony and intrigue, deftly and dazzlingly plotted, The Defection of A.J. Lewinter is the novel that established Robert Littell as a master of the Cold War thriller and immediately elevated him to the ranks of John le Carré, Len Deighton, and Graham Greene. To ask other readers questions about The Defection of A.J. Lewinter, please sign up. A few years ago I came across Robert Littell, a highly recommended author in the spy genre-someone, I was told, who was equal or better than John le Carré one of my favorite authors. I have previously read Legends, which explores what happens to someone who has so many legends or identities that he begins to lose sight of who he really is and am planning to read The Company, a 900 page novel about the 40 year history of the CIA, but before I began such a huge endeavor I though it might be fun to A few years ago I came across Robert Littell, a highly recommended author in the spy genre-someone, I was told, who was equal or better than John le Carré one of my favorite authors. I have previously read Legends, which explores what happens to someone who has so many legends or identities that he begins to lose sight of who he really is and am planning to read The Company, a 900 page novel about the 40 year history of the CIA, but before I began such a huge endeavor I though it might be fun to read Littell’s first book written in 1973, The Defection of A.J. Lewinter. A.J Lewinter is an eccentric physicist working on the ceramics use in the nose cones of ballistic missiles when one day he decides to defect to the Soviet Union. Although at one level it seems like Lewinter whose ceramic specialty is not top secret technology, does not have anything of much importance to give to the Soviet Union, a cat and mouse game ensues with each side trying to out bluff and out connive the other in order to gain an advantage in the Cold War. On the US side is a cold and calculating CIA operative named Diamond who heads up the investigation into what Lewinter knows and what he could possibly be giving the Soviets, while at the same time trying to send signals to the Soviets which he hopes will trick them into thinking that Lewinter is a fake or suspect his information. On the Soviet side, Pogodin must evaluate whether Lewinter who claims to have the missile trajectory codes is who he says he is or is really just a plant of the CIA. As each side goes to greater and greater lengths to protect its secrets and guess what the other side is up to in order to gain an advantage, the absurdity of the whole situation becomes both wickedly funny and morbidly sad. Diamond is ruthless and calculating, stopping at nothing to out think and out maneuver Pogodin into thinking that Lewinter is a CIA plant and that the information he has is fake. Pogodin on the other hand knows that the risks for him in making the wrong decision regarding Lewinter could not only have lasting consequences on his career but also on the stability of the Soviet government who if they knew the codes were real could then spend less on guns and more on butter and create a better life for its citizens. Littell seemed oddly prescient since I was reading this when Snowden and his revelations about the NSA were in the news. I could imagine both the NSA and CIA trying to do the same kind of damage control as Littell describes. Interestingly early on in the Snowden scandal, the idea that he couldn’t possibly know what he claimed to know since he didn’t have the necessary clearance level seemed to be what was mainly in the news, and then in a few days that changed just as it did with Lewinter. This is a spy story, without a lot of car chases or physical action, but Littell manages to make the cerebral cat and mouse maneuvering between Pogodin and Diamond as thrilling as if it were a car chase! Read more reviews at Brendasbookshelf@wordpress.com. A.J. Lewinter is a scientist with a specialty in ceramics, working at MIT on a project about ceramic nosecones for ballistic missiles, and as the book opens, in Japan for a conference. After spending some time at a Noh theater performance, he goes to the Russian Embassy, where he makes it known that he wants to defect. At first, they do not take him seriously, but when questioned further, he offers up a formula and the next thing you know, he's on a plane for the USSR with nothing but a dozen bo A.J. Lewinter is a scientist with a specialty in ceramics, working at MIT on a project about ceramic nosecones for ballistic missiles, and as the book opens, in Japan for a conference. After spending some time at a Noh theater performance, he goes to the Russian Embassy, where he makes it known that he wants to defect. At first, they do not take him seriously, but when questioned further, he offers up a formula and the next thing you know, he's on a plane for the USSR with nothing but a dozen bottles of Head and Shoulders shampoo and 500 Chlor-Trimetron allergy pills. And here begins a story that is a bit of a mind boggler. The book is structured like a chess game, and within that structure the actions of international agents also play out like a chess game, each side trying to make the other side guess as to whether or not a) Lewinter's defection is genuine, or b) whether or not the information he has to offer the USSR is worthless or priceless. I won't say more about the plot, because any info would totally wreck someone else's reading experience. The world of espionage is fascinating, and I'm sure that a lot of the tactics used in this book have some basis in fact, because it's really difficult to believe someone could just make up the convoluted machinations of our intelligence operatives. The writing is absolutely superb and I was not prepared for the ending. I spent way too much time trying to figure out "what would happen if..." after I finished the book. To me, that speaks highly of the author, and now I can't wait to get my hands on more by Littell. As if the tbr pile wasn't huge enough already -- sigh--. Definitely recommended; I'd say that people who enjoy novels of espionage, the Cold War, and the inner workings of our intelligence agencies would enjoy it the most. A great cold war spy novel. The book had plenty of intrigue, competing motivations, and a darkly cynical tone that I really enjoyed. I listened to the audio version which was narrated by Scott Brick. Synopsis: Lewinter is an American scientist playing both sides against the middle. He's telling the Russians he wants to defect but does he? A ceramics specialist involved in designing the nose-cones for MIRV missiles defects to the USSR, and the various intelligence organizations on both sides of the Iron Curtain attempt to evaluate the defection. Is it important? Is it a genuine defection or a US attempt to embarrass the Soviets or plant an agent among them? What could Lewinter know that might be of any significance? And so on and so forth, to endless ramification. Lewinter himself barely appears in the book, and we never discover the answer to any of these questions; the central character is really the swirling paranoia endemic on either side during the Cold War, and not just in the intelligence communities. We're shocked by the ruthlessness with which some of the Russians behave in service of this paranoia; but Littell portrays their US counterparts behaving equally coldbloodedly. These are the dimwits who spend an inordinate amount of our tax dollars on what they insist is realpolitik when in fact it's just buffoonery -- buffoonery that'd be hilarious if it didn't destroy so many lives and strangle at birth so many endeavours that might improve the human lot. Neither side is remotely interested in -- regards as entirely trivial -- what is, if it works, the item of real value that Lewinter bears: the technology for an improved and environmentally friendly method of waste disposal. This isn't the masterpiece of the spy thriller genre promised on the cover, for the very good reason it's not a thriller at all, and clearly has no intention whatsoever of trying to be one. Instead, it's a satire -- quite often a very funny one, more often a very dark one. It's in no sense a gripping read; but I think it's probably a very good book. I'm glad I read it, and in due course I may very well read it again. As an aside, Penguin should be ashamed of themselves. I read the 2003 reissue, which has clearly been OCRed and typeset from an earlier edition without the benefit of any competent proofreading. There's a secondary character whose surname I still don't know, because two different versions of it (Ferri and Fern) turn up with equal frequency. There are countless irritating minor literals (missing close-quotes are a frequent culprit), and in several places the text is so garbled as to be incomprehensible. This is beyond shoddy. It's pretty sad when I suddenly realized that I was nostalgic for the days of the Cold War. It was so easy having a clear-cut enemy, as opposed to finding out that it is we who, in fact, are our own worst enemies. One of the moderators of a Yahoo! 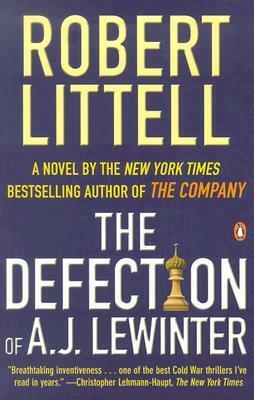 group to which I belong recommended The Defection of A. J. Lewinter to me -- the first of a series of Cold War thrillers by Robert Littell. I was quite pleased by this densely-packed study of what happens -- on both sides of the Iron Curtain -- when an It's pretty sad when I suddenly realized that I was nostalgic for the days of the Cold War. It was so easy having a clear-cut enemy, as opposed to finding out that it is we who, in fact, are our own worst enemies. One of the moderators of a Yahoo! group to which I belong recommended The Defection of A. J. Lewinter to me -- the first of a series of Cold War thrillers by Robert Littell. I was quite pleased by this densely-packed study of what happens -- on both sides of the Iron Curtain -- when an American with access to American military secrets defects to the Soviet Union. Stored in his brain are the trajectories of the MIRVs (Multiple Independently Targetable Reentry Vehicles) that were the latest thing in 1973, when the book was written. These MIRVs would enable a single ICBM missile to have multiple nuclear payloads, as well as radar-jamming units and drones to confuse the Soviets. Lewinter himself is something of a no one, a man who really wants to work on a system to handle the nation's garbage, but winds up working for the military at MIT. Once he defects, the attention shifts to Leo Diamond on the U.S. side and Yevgeny Mikhailovich Pogodin for the Russkies. What I liked about the book is that its author understood the complex moves on both sides involving trust vs distrust, belief vs disbelief, small victories vs large defeats, and so on. It is, in the end, a chess game of sorts, a fact that Littell underlines by labeling his sections with chess terms. This clever spy novel would be comic if it weren't so plausible. Is the defector Lewinter a fraud or real? What is the impact on the Russian economy if the information they've been given is true? What is the US going to do about the defection? Schemes and counter schemes, bluff and double bluff, right to the last sentence. Having grown up during the Cold War, I know enjoy reading novels about the Cold War since it was\is clear who the "bad guys" are. This book, about the defection of an American scientist, is a quick read. It's strong on the procedurals (how the Americans and Russians react to the defection) and the story is laced with dry humor and irony. Especially at the end of the book. Another home run by Littell. A fast paced spy novel - easily read in a siting or two. Of course the genius of Littell is not necessarily the story. That is secondary. It is his character development as in all his novels that make them all five star. This is another one. This early Littell is a good indicator of much of Littell's future themes: duplicity, bureaucratic infighting, irony, subversion, etc. One of his most influential works, athough probably not his best, but a great early effort. My absolute favorite spy novel. It's the most accurate I've found in capturing the feel of actually working within the intelligence community. Littell's first and best in my view. They've gradually gone downhill from this one. It took a bit to figure out what was going on, and I put this down for a while and came back to it a couple of months later. But once I figured out what was going on, I sped through the rest in two days. This is spy/thriller, but less James Bond than John LeCarre novel. Lewinter defects to Russia, bringing with him secret plans for the trajectories of MIRV warheads....or did he? The entire novel consists of a complex multi-layered chess game on both the Russian side (is Lewinter a real defector wi It took a bit to figure out what was going on, and I put this down for a while and came back to it a couple of months later. But once I figured out what was going on, I sped through the rest in two days. The entire novel consists of a complex multi-layered chess game on both the Russian side (is Lewinter a real defector with real information, or is he a fake defector, trying to send Russia on a wild goose chase? ), and from the US side (do they try to convince the Russians Lewinter is a fake, or would that just convince the Russians he is legitimate). The problem with foci pushing on the chess game is that we never get any sense of the inner life of any of the characters--including Lewinter, but also including most of the Russians and all of the Americans. Ironically, the best developed character is a marginal Russian author/intellectual, who briefly interacts with Lewinter at a party. A taut novel of espionage that seems a little dated now. Employing ironic parallelism to heighten dramatic surprise, this book highlights the kafkaesque absurdism--and the impossibility of being wholly subservient to an ideology and simultaneously claiming an abstract moral superiority. Is the defector A. J. Lewinter real or a plant? Does the USA even know whether he is real? Can the USSR be sure if he is real or a plant? Is the USA signaling to the USSR by their actions that the defector is real or do they just want the USSR to think he is real? Is the USSR signaling to the USA that they think the defector is real or do they just want the USA to think they think he is real? Does it even matter to the USA or USSR whether he is real or a plant? Una novela interesante pero muy alejada de la clásica novela de espías, con mucha acción y donde buenos y malos están claramente marcados antes de empezar la trama. En esta novela el autor se centra en la paranoia que inundaba a rusos y americanos durante la guerra fría y como cualquier acto, hasta cierto punto insignificante, podía cambiar radicalmente la política de unos y otros. Lectura entretenida y sobretodo muy fácil de leer por lo cortita que es. "All I know is that they expect me to pull off big coups with second-rate people - present company excluded." "We lived in a wooden house with the windows painted on the outside. Ha! I've come full circle. In my youth, the windows were painted on the outside; now they're painted on the inside." quick/interesting read of spy craft. The plot was readable, the dialogue was interesting, and the character development was alright. Yet, somehow, this book seemed to be lacking something significant. I was amazed by the Company but felt that The Defection of A. J. Lewinter wasn't quite Robert Littell's normal fascinating espionage thriller standards. When an American scientist defects to Russia, a great game begins. Is this a real defection? Is this a plant of miss information orchestrated by the American intelligence agency? The twist and turns look like two grand masters playing chess… Blindfolded. After reading the reviews on the back of the book, I was expecting a more moving experience from this short novel. One of the reviews even calls Littell "the American Le Carre," but I would not go anywhere near that far. There were redeeming aspects to this book, but I was left wanting more. A quick read that evokes nostalgia for the pathos and absurdity of Cold War gamesmanship. Quick, entertaining read about spying during the Cold War days. It's a very solid debut and spy novel, but some parts could be tweaked. Great dialogue. I found this book slow and boring. I expected an action adventure story and found naval gazing.